Commemorating Armistice Day at National Botanic Gardens, Kilmacurragh. November 11th 2018 marks one hundred years since Armistice Day when a hard-won peace reigned over Europe. By the time soldiers were returning to Ireland, almost 50,000 of their fellow countrymen lay buried in distant lands. Many years later, Phylis, Lady Moore, wife of Sir Frederick Moore, Keeper of the National Botanic Gardens, Glasnevin, sadly related that after the Great War, ‘many an Irish demesne gate had closed, never to open again.’ It was a time of shocking death duties and with staggering changes of land ownership, as a result of so many casualties. The war meant the loss of an entire generation of young men, many of whom were professional gardeners or owners of large gardens and demesnes. 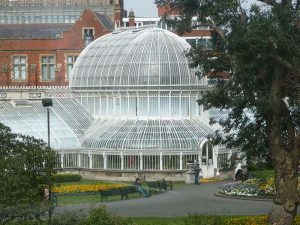 The three major botanic gardens of Great Britain and Ireland; Edinburgh, Glasnevin and Kew, all suffered badly. It’s said that material coming into this renowned trio, from the great plant hunters of the time, fared badly because many of their most skilled staff had been lost on the European battlefields. 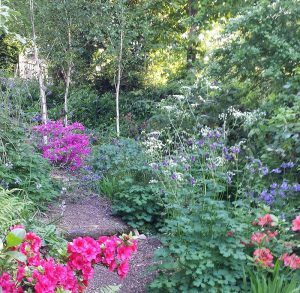 The Royal Botanic Garden, Edinburgh named a number of newly described species after their war dead, while at the Royal Botanic Gardens, Kew, the garden’s war dead are honoured on commemorative plaques in the Temple of Arethusa near the Victoria Gate. No such memorial exists at Glasnevin, though the Kew plaque carries the name of Private Charles Frederick Ball, of the Royal Dublin Fusiliers (who had their headquarters in Naas, Co. Kildare). C. F. Ball was Glasnevin’s Assistant Keeper and had formerly worked at Kew. He was killed at Gallipoli in September 1915, aged just 36, and had apparently collected seeds of various plants, including Gallipoli oaks for Kew and Glasnevin during his time there. He was one of three staff members never to make it back to Glasnevin. The Temple of Arethusa, designed as a folly for Princess Augusta by Sir William Chambers in 1758, overlooks Kew’s iconic Great Palm House and pond, and until recently, one of the garden’s most famous trees grew on the Victoria Gate side of the pond, by a pair of Chinese lion dogs. The tree in question was a sessile oak, Quercus petraea, grown from an acorn collected on the muddy battlefields of Verdun, France in the autumn of 1916. One of the longest battles of WW1, lasting from February to December 1916, it also devastated massive swathes of Verdun’s oak and chestnut forests. It is hard to think of so many young horticulturists and plant enthusiasts forced into such ferocious fighting, yet this un-named soldier found the time to gather acorns from beyond the trenches and send them to Kew where a sapling was planted in a prominent spot by the Great Palm House in January 1919. It was sad then, when this notable tree was hit by the severe St Jude’s Day storm that hit the south of England in October 2013 and was so badly damaged that it needed removal just before the Armistice Day remembrances for that year. 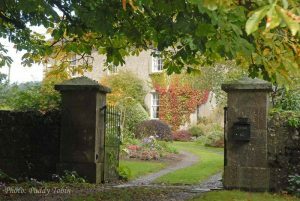 By chance Thomas Pakenham, on a visit to Kew, had gathered acorns from the tree, before its sudden demise, and raised several at Tullynally Castle in Co. Westmeath. 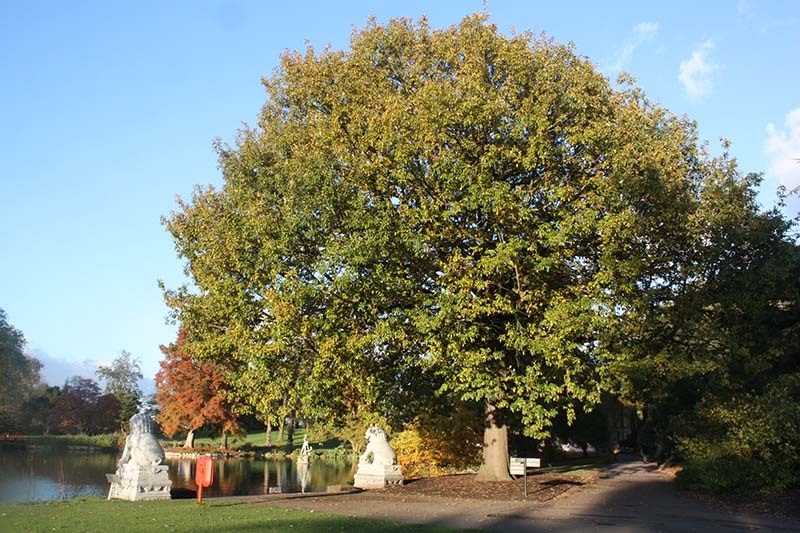 After a visit there a number of years ago, I left with one of Thomas’s young seedling and so the progeny of Kew’s historic Verdun oak persists in a number of Irish gardens. The Tullynally seedling is now almost 2 m tall here at Kilmacurragh and thriving. As a mark of respect to those Irishmen who died in the Great War, particularly those who were gardeners, a gathering will take place at Kilmacurragh at 11 am on November 11th 2018, when on the 11th hour of the 11th day of the 11th month, Thomas Pakenham, will plant the Verdun oak seedling on the 18th century Pond Vista, by the ruins of the drawing room of Kilmacurragh House, which saw two consecutive owners die in 1915 and 1916, alongside several tenants and gardeners from the estate. 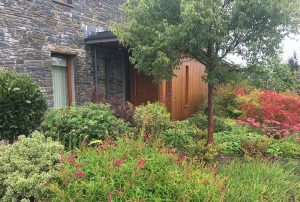 The event will be attended by the principal Irish gardening and arboricultural societies; the Irish Garden Plant Society, the Irish Tree Society, the Royal Horticultural Society of Ireland, among others. November 11th 2018 at 11 am. 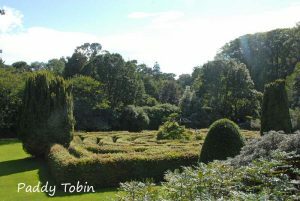 National Botanic Gardens, Kilmacurragh. Meet in visitor car park at 10.45.